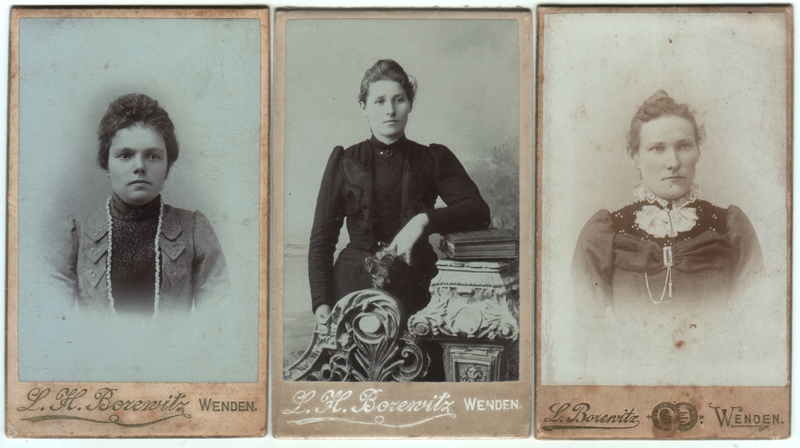 Three cartes de visite (or perhaps three CDV-sized cabinet cards), each measuring slightly less than 2.5 x 4.25 inches. 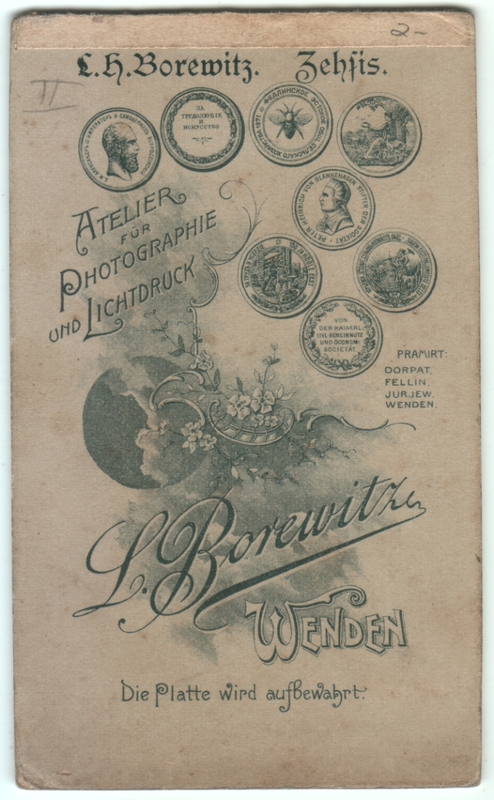 Photographer is L. H. Borewitz of Wenden (now Cesis), Latvia. Otherwise undated and unidentified. I’ve mentioned before that I somehow ended up with a bunch of photos taken by this particular Latvian photographer. I previously posted one here, and another here. Then the other day I just posted the rest of the men here. Today it’s the rest of the women (unless I find more). As always, when there are common denominators like we have here, I think it’s interesting to compare and contrast. And yes, the two on the left are bluish, it’s not just my scanner acting up again. I’m wondering if the picture on the right is an older picture. The colors are different as is the photographer stamp. That could be. I think the color is just a style choice, but you’d think the advertising on the back would be standard, so maybe, as you say, the blank one is older (or he just ran out). The ladies in the middle and right look related. Same noses! The photo style of the left and right images are pretty much the same. The lady on the right is wearing quite a bit of embellishment! The one in the middle seems to be the friendliest. Of course, she could have just been the most comfortable – after all, she has something to lean on! Impossible to know for sure, but those are good guesses, I think.